Getting a little mismatched in kitchen cabinet color designs is no longer being viewed as an unfinished reno job, but instead perfectly stylish in fitting with today’s trends. 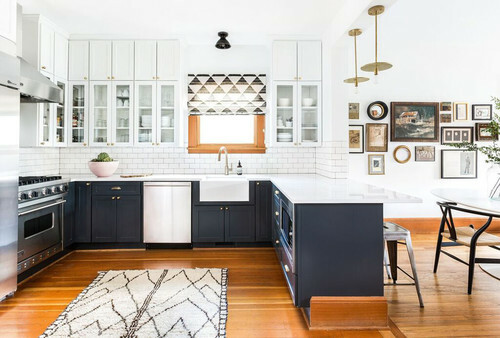 These “tuxedo kitchens,” as they’re so nicknamed, are where the upper cabinets may be in one color—like in all white—and then the lower cabinets are in a contrasting shade, like a gray or dark walnut. It’s essentially a way to color block your cabinets. The idea of going with two different shades on your kitchen cabinets may make some homeowners’ a little uneasy, but it’s nothing to fear nowadays and can actually make your kitchen look more open. 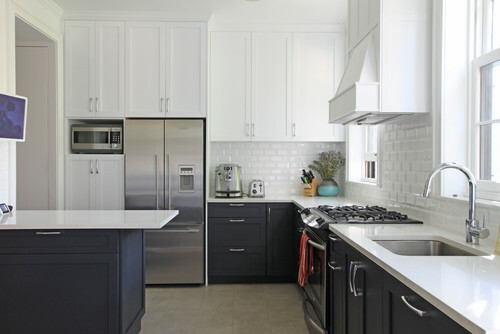 Typically, with tuxedo cabinets, the lighter color is on top and a darker color is on the bottom. It can help make a kitchen seem taller when the lighter color is above. It can also create a focal point, when a contrasting color is used on a kitchen island. The differing shades can also break up the monotony of all one color cabinets, particularly in all-white kitchens. 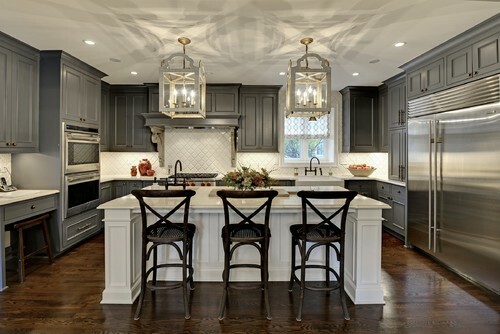 Some real estate studies say that white cabinets contrasted by a dark navy blue or black kitchen island is among the most common tuxedo kitchen pairings in some real estate listings too. This new trend is sure to dominate the kitchen designs of every home soon. Kitchens have always been one of the biggest focal points in a home. It’s necessary to spice it up with designs like this. This two toned look has been around for years and is a great way to really update and create a new look for a dated kitchen. How can I share these awesome blogs on social media without attaching the entire Realtor Magazine?? My clients would love these articles. Love the second image. The dark grey cabinets with the white uppers and the hardwood floors looks great!